I bought this top on Sunday when it was $17 - it is now $15 - and that $2 *almost* bothers me - lol. Loft has a whole lot of good stuff on sale right now. My biggest problem when I went shopping this weekend was the color selection. Lots of puce in store. I know exactly two people that look good in puce - Kari and Debye. That's so funny that the $2 bothers you (it would me too, that's why I'm laughing)! The outfit looks great on you though, and I really like the special detail around the neckline of the top. The shoes are a nice mix to the color pallette too. The $2 different would have bothered me too...but I think it's less about the amount and more about the fact that I couldn't resist long enough for the price to fall further. In any case, I love that LOFT bib top on you. Navy looks great on you! I hate when I buy something and the next day or so it goes on sale. Bothers me to no end! The top is cute, I am trying to stay as far away from Loft as I can otherwise I would go get it. Great buys!!!! Two bucks diffrence - I think you still got a great deal!!!. Unrelated: I just dropped you an email. If this is the type of sale they're having now, can you imagine what deals we'll see as we get into the holiday season. Oh, I can't wait. The tee looks great with the jacket. Me? I probably would have tried to get a credit for the $2 lol. OMG you girls - you would laugh at me tearing my hair out now with the extra 30% out LOL! (only kidding, but it is a little funny that a few days make the difference between $100 spend and $70 spend) ah well. 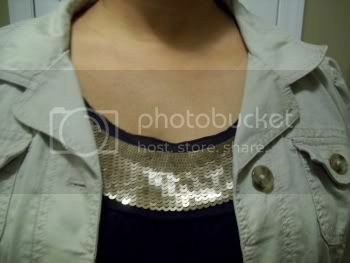 That sequin bib top looks great on you. I didn't like it so much on me, but still liked the sparkle aspect of course. Loft and their sales. It's hard to know when to swipe one's card there.